There's a mass movement of animals afoot in the U.S. - and it's not the good kind. More than a million American households give up their pets every year, according to a recent study by the American Society for the Prevention of Cruelty to Animals (ASPCA). The study, published in the Open Journal of Animal Sciences, shows pets being rehomed at a rate of around 6.12 million households every five years. The top destination for rehomed pets? Family and friends. 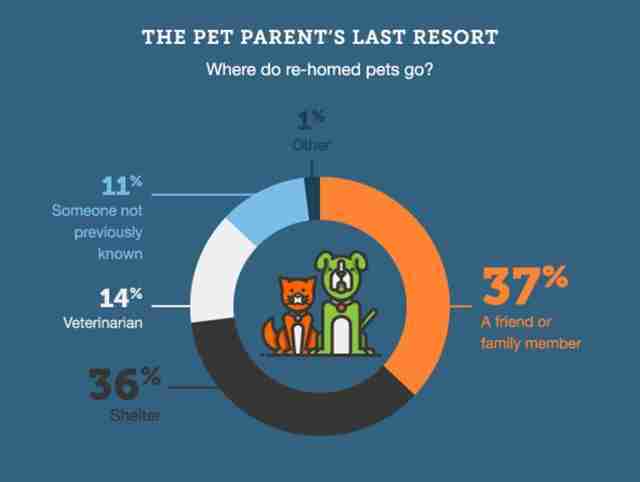 Animal shelters are the second most likely destination, at just one percentage point behind. The reasons for rehoming, as the study notes, are myriad. But financial hardship looms large. "We wanted to know more about the general state of rehoming in this country in hopes there would be some areas where we might be able to develop programs or processes to help people keep their pets home," Emily Weiss, the ASPCA's vice president of research and development, told The Dodo. "We feel pretty strongly that one of the best ways to end homelessness is to keep people and their pets together in the first place." We feel very much the same. If you're thinking about dropping off your pet at a shelter, take a moment to read this. Also, have a look at the excellent resources the ASPCA offers with its 'Safety Net' program.